Buy this wheelchair coat pattern now! 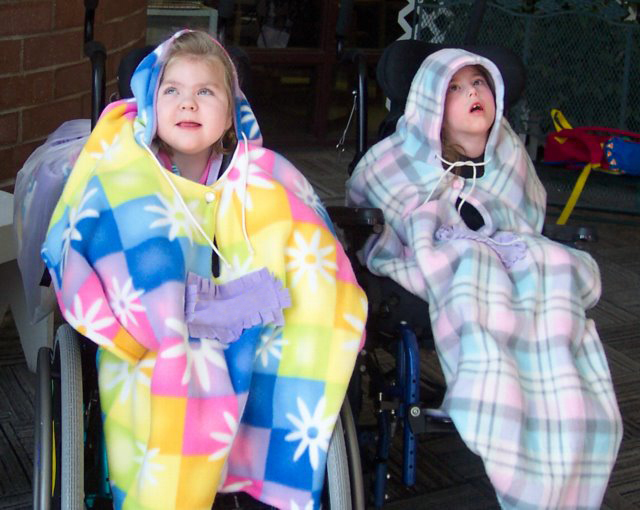 When Becca was very little, I got frustrated every winter trying to keep her warm in her wheelchair. Other Moms I knew bought nice coats for their kids and then put them on backwards to avoid having to adjust straps and restraints back and forth. It’s a lot like what happens with a child in a carseat during the wintertime if your carseat was expected to go inside with them, too. If you adjust the straps for the child while wearing a coat, you have to adjust them back while they’re inside, not wearing their coat. I knew there had to be a better way! Instead of a coat, tucking blankets in around her worked really well except for her head and neck. With a coat on backwards, I was still wrapping her legs in blankets. I was adding so many pieces to keep her warm and things would get lost at school since I was counting on teachers and aides to dress and undress my child for the weather; hats, scarves, multiple blankets, etc. I liked tucking her in, but I needed to keep her head and neck warm. When we went somewhere in the car, we would have to sit her in her wheelchair out in the weather, buckle her in and then put her coat back on over the buckles. I hated those moments of freezing cold or snow or rain falling on her before her coat could be put back on. 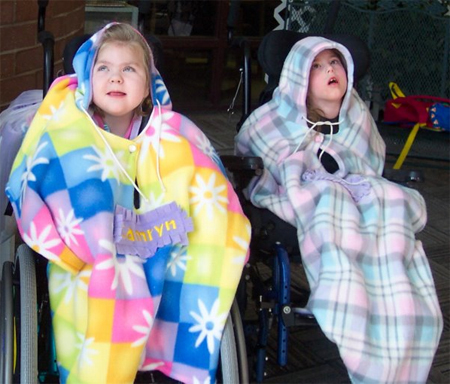 At first, I called them wheelchair capes as our kids are definitely super heroes in their own right. The first one I did was two layers of fleece and had awkward seams around the face, but it worked great and kept her warm! Teachers loved the ease of throwing it over the top of her buckles and straps and tucking her in. I loved that it was easy to wash, didn’t get caught in her wheels like blankets did AND it was super cute! People would come up to ask about the coat and Becca would smile at the attention. And she could sit in her chair outside all covered up as we reached in and buckled her up. As time went on, I came up with a way to sew things together around the hood so that the seams looked nice and finished. It took lots of trial and error and I used to forget how I’d done it from one coat to the next. I starting sewing them for friends and even put them up online for a while. Every coat was different and had different challenges. I would work so hard on a coat and then never hear back if it worked out for them. No news is good news, I guess, and I hope they fit and did their jobs well. I have been wanting to share my pattern for a while now. I wanted to share my tips and tricks so that people could make their own coats. So many family members want to help and don’t know how. I just can’t sew a wheelchair coat for every man, woman and child who needs one all by myself! I was worried about how I was going to explain my neat trick for enclosing all of the seams. But it was teaching sewing… something that comes naturally to me. As soon as the camera was rolling, there were no nerves, just explaining something I thought was cool to someone else who needed to know. I am SO excited to start answering questions and helping people sew wheelchair coats for their loved ones! I am thrilled that this will mean more snuggly warmth in the world. And I hope, now that there are several great social media platforms, that I will get to see some of the coats that are created and share in the joy.